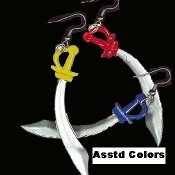 PIRATE SWORD EARRINGS Punk Emo Costume Jewelry - 1Pair, chosen from assorted colors, as shown. Avast all ye swashbucklers, pirates and piratesses! This is a must-have accessory for fans of Captain Jack Sparrow, all Pirates of the Caribbean, and the Black Pearl. Rubbery plastic miniature toy charm, approx. 2-3/4" long.